A middle aged couple, Mr. and Mrs. Evans, walked into their bank one day to apply for a car loan. Their banker took a quick look at their file and asked them if their financial situation had changed since the last time they had borrowed. They replied that nothing had really changed. Their house had gone up a little in value, their debts were roughly the same, Mr. Evans was still working at the same job and Mrs. Evans was now working part-time. Everything sounded fine. Because the couple had solid income, a good payment history and a decent net worth, their banker told them the car loan would be no problem. He then offered to prepare the paperwork on the spot. The couple agreed and chatted casually with their banker until he looked up from his paperwork with a concerned look on his face. A couple of years ago, Mr. and Mrs. Evans had helped their son buy his first car by co-signing his car loan. While he was now able to manage his affairs on his own, there was a six month period where he was out of work and not able to keep up with his payments. That took a toll not only on his credit rating, but on his parent's as well. 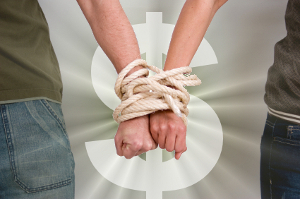 People are often shocked by the ways in which joint debts can affect them. To help you avoid these pitfalls, we’ve laid out the top three ways that people can get tripped-up by joint debts. Typically the person who earns more is the primary borrower when a new credit application is processed. The secondary borrower is still important, but some financial institutions only report information about a debt on the primary borrower’s credit file. The name of the second person who signs is overlooked for reporting purposes. When information about a debt, including a good payment history, is not reported on a credit file, it basically doesn’t exist and is therefore, not able to help someone build a credit rating. To avoid this problem, everyone who is using credit should have something in their own name, or a debt where they are the primary borrower. While many couples have everything joint, a small credit card with a $500 limit that is used once every few months, is enough to build a separate credit rating – but not enough to jeopardize handling finances jointly. This is another good reason why you should check your credit report from time to time to make sure that everything is reporting as it should. A legal separation agreement doesn't change the fact that both of you signed for the debt and even though you're no longer in a relationship with each other, you are each still 100% responsible for the whole amount of the debt. If the person who is supposed to make payments on the debt stops, then the other person will have to continue making the payments until the debt is paid off. If a couple separates and they want to separate their debts as well, then each of them needs to each apply and qualify for a specific debt on their own. If a creditor refuses to drop the other person’s name from the debt, then the debt will have to remain in joint names until it is paid off. And again, if one person stops paying or declares bankruptcy, the other person becomes responsible for making the payments or risks the creditors pursuing collection activities against them. Either way, this will impact their credit report. Joint debts can also cause problems for parents when they apply for a joint line of credit to help their child through college or apply for a joint credit card to help their child establish a credit rating. Again, when you are joint on a debt, you are 100% responsible for it. If your child stops making payments on the debt, the lender will demand payments from you, and if your child doesn’t always make their payments on time, it will impact your credit rating negatively as well. Joint debt can also impact your ability to obtain further credit. A parent could apply for a loan or a mortgage, and it’s possible that they may not qualify because the lender doesn’t think that they have enough income to pay for both the child’s debt plus the proposed new debt. This happens because a lender must assume the worst case scenario in their calculations, because it happens more often than many people realize. Joint debt can be a great tool for family members to work together and help each other out. Check your credit report and make sure that you and your partner each have at least one debt preferably a revolving form of credit like a credit card, reporting in your name. Before signing for any joint debt, consider what you would do if the responsibility for this debt fell completely on your shoulders. Would you be able to handle the extra payments. You may also want to make sure that you and the person you are joint with have the right insurance just in case either of you passes away or gets hurt and is no longer able to maintain your current income. Your lender or insurance agent can provide you with more information so that you can make an informed decision. Find out more about the dangers of co-signing by clicking here.